Heuchera Paris- Amazing flower power that lasts All Summer! 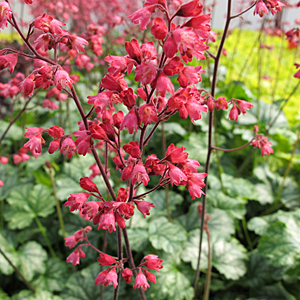 (Coral Bells) Heuchera ‘Paris‘ PP18,881 is a free-flowering cousin to ‘Hollywood’ PP17,129 with striking, medium size white-veiled leaves that give rise to columns of large, deep rose colored flowers. An excellent repeat bloomer which makes ‘Paris’ PP18,881 great in containers and in the border. Hummingbirds and butterflies will love the bright color!